Wheat stubble fills the spaces between fencerows along narrow country roads here in central Indiana. To describe what’s left of the field as straw-colored seems a redundancy. For those who didn’t grow up in rural America, straw is the byproduct of a wheat harvest — the leftover stalks are typically baled to serve as bedding for livestock. Today’s combines taking in the wheat are monstrous machines. More than a century ago, steam engines and threshers were substantial too, at least compared to anything else found on a farm. But other than size, there are few similarities between the harvesters of now and then. Not the least of the differences is price. An upper-end John Deere combine can cost more than $500,000. Early farm equipment wasn’t cheap, either, and implement companies aggressively competed for a farmer’s money. In an era when many people in rural America had little schooling and were often illiterate, colorful advertisements became a widely used medium to draw the attention of potential buyers. Those broadsides are still turning heads. Ironically, they can cost more than the equipment they promoted. An example sold by Cowan’s Auctions in June 2010 touted the Advanced Thresher Company of Battle Creek, Michigan. 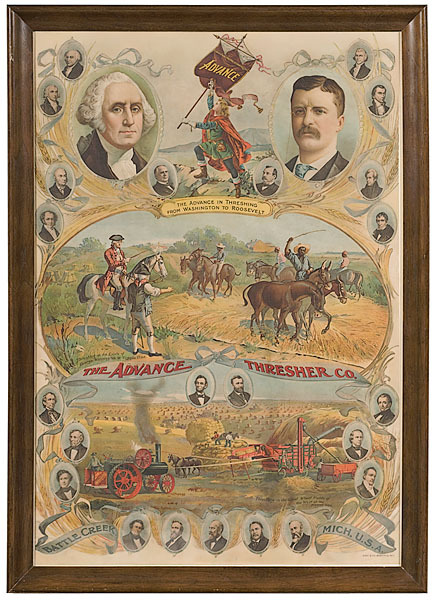 From the early 20th century, this clever marketing tool used a historical theme, The Advance In Threshing From Washington to Roosevelt, picturing portraits of U.S. presidents beginning with George and ending with Teddy. A pair of illustrations depicted harvests of the two periods, from slaves working under the watchful eye of their masters to a steam engine operating a thresher in rolling countryside dotted with wheat shocks to the horizon. Measuring approximately 35 by 24 inches (sight) plus frame, the chromolithograph sold for $3,290 — a price that generally limits such items to advanced collectors. There are affordable alternatives. 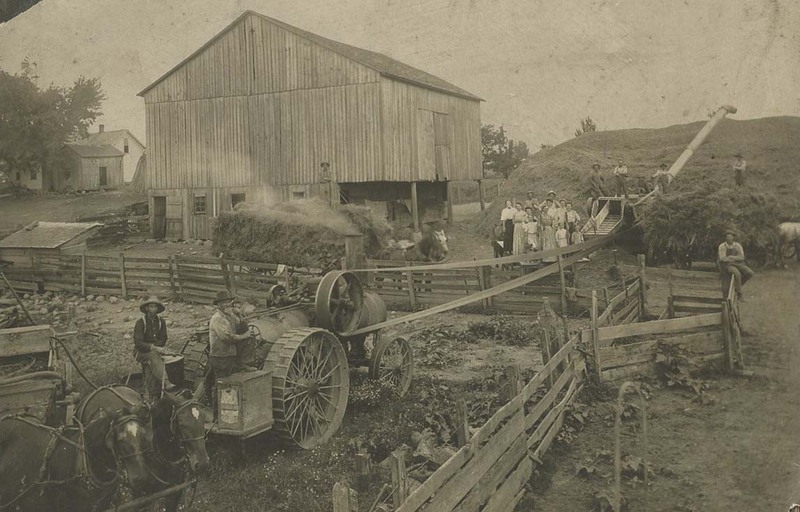 Vintage photographs of harvest scenes from the turn of the 20th century can still be purchased for under $100 — some for much less. The example I bought at the Indie Arts & Vintage Marketplace in Indianapolis last weekend was $7. My purchase wasn’t pristine — the mounting board had been cut down, and the photo had some losses at the corners, but the image can be easily matted and framed to crop out the major distractions, leaving a vivid barnyard scene that includes a steam engine and thresher, horse-drawn wagons loaded with wheat to be winnowed, workers and family members, and a mound of straw the size of a house. The chromolithograph and photo are great examples of rural life in a time far removed.